How I hate thee. Let me count the ways. You seem innocent enough, with your little wooden squares and "family learning time fun," that is until men get involved. Then things just get all crazy. Too many sisters, too many. I dared say something to the husband about how maybe he should just let the boy make the friggin' car by himself. Wow. That ended badly. Like, EPIC bad. Well, three cars later we (and by "we" I mean, my husband) finally had a winner. Sure there had been an unholy amount of money spent on tungsten weight (it is denser dumba$$!) and trued wheels and precision bored holes for the above wheels and paint and who knows what else. (I accidentally ran across ONE of the receipts today and almost choked on my tongue.) It is pretty much time I got a new pair of shoes. I feel totally justified in that now. I saw this movie once about the Pinewood Derby. It was called "Down and Derby." It is actually kind of a funny movie about three dads who totally take over their son's car making and end up losing their jobs and wives and all self respect. It is kind of a funny movie until you are actually the wife in the scenario and then it is no longer funny. Then it is just a very bad joke. Kind of like when I heard somebody ask Roseanne Cash how she liked that movie, "Walk The Line", about her father's life and she said something about how it wasn't actually enjoyable to watch your parent's divorce played out again many years later in a movie theater. Blech. I have spent a little time wondering what the HELL is wrong with men when it comes to the Pinewood Derby. Why do they all seem to resent the fact that their own father's took over and controlled and freaked out over their own cars as children, yet they grow up and do the same thing to their children? Why can't they bring themselves to not care? Is it really going to kill a kid if he doesn't come in first place? I realize the stupidity of our current "everybody is a winner" culture, but would it really ruin childhood to lose every now and again? So, I guess that men are just as irrational as women when it comes to getting things "just right" so that the kid can "enjoy that day and have it be perfect" when in fact they are actually kind of having a panic attack spread out over an entire week during which time they also cause irreversible harm to their significant other who will never be the same emotionally again. The good news is that the car won! It was incredibly fast. People were trying to figure out the "secret" to its winning power. The boy was very pleased. He did get to participate in the building of it (some) and was really excited to be a winner. I guess being a winner is nice sometimes. The good news is that in approximately 9 years I will no longer have to worry about the Pinewood Derby and I only have one son so this won't be repeated with numerous children. The bad news is that I have three daughters whose wedding I will someday get to plan for them while I secretly freak out about them soon being legally bound to some jerk who will later be a wack job when it comes to the Pinewood Derby. Also bad news, I probably am not helping my relationship with this post, but after the week I just had, I am sort of OK with this passive-aggressive display of very public sarcasm. 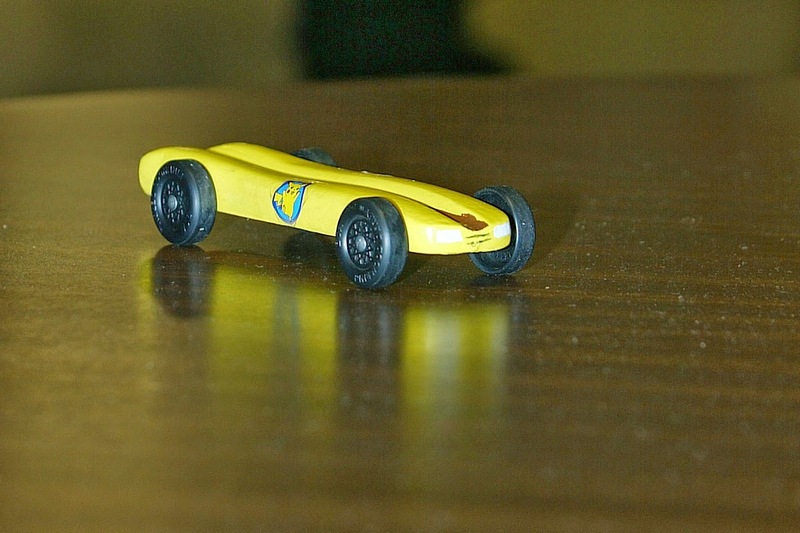 PS- I would be happy to give you the secrets to the perfect, winning, super-fast, Pinewood Derby car. I am shameless that way. I am not looking forward to my son's first Pinewood Derby...I loath Pinewood Derby's. They are suppose to be fun for the kids but they turn into a major competition (don't get me wrong - winning and losing are part of life but this gets over the top crazy). I am actually to the point that I don't want to be involved but alas...it will happen and I will cheer for my kid. my hubs just said : "What's wrong with that? That's what you do with a pinewood derby car...and with a little more research it could have gone even faster." Our first pinewood derby together will be this fall, I can hardly wait.